Debut Album "Liszt-Totentanz & Symphonic Poems"
"It’s literally a mind-blowing extravaganza of scintillating pianism." "This is a spectacular debut recital disc, well-recorded and inclusive of some well-written documentation in English, German and Japanese. 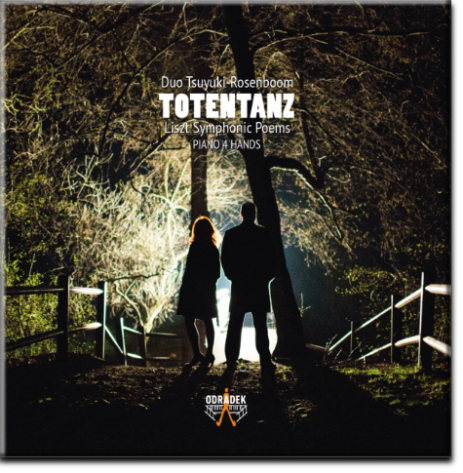 The Duo Tsuyuki-Rosenboom’s polished performances are carefully detailed, idiomatically phrased and finely-graded dynamically. Their like-minded commitment, shared empathy and singularity of vision, secure the performance’s success. You’re in for a treat." What’s most striking about these performances is their finesse. Four-hand music, by its very nature, risks clutter—and Liszt’s hyperactive imagination, especially in his transcriptions of orchestral music, only increases the hazard. But as is evident from the light-fingered opening of Mazeppa, usually one of Liszt’s more strenuous scores, Tsuyuki and Rosenboom nimbly avoid the pitfall. As a result, the music sounds remarkably fresh: Whether in the expectant beginning of Hunnenschlacht or the gentleness of the Allegretto pastorale in Les Préludes or the splashes of proto-Impressionistic colors in Mazeppa, this is Liszt of the utmost sensitivity. Rhythms are zesty rather than pushy; dynamics are handled with poise (listen to the way they build into the Andante maestoso toward the beginning of Les Préludes); and balances between main material and decoration are handled with unusual tact. Some, perhaps, might want weightier bass lines and more sheer vehemence in the climaxes—but if you’re open to a gentler approach, you’ll find these performances full of revelations. Tsuyuki and Rosenboom present four works in very good performances(...). The symphonic poem arrangements are difficult to find on records. The Totentanz-arrangement is performed exceptionally well, but presents a few aural items that need to be discussed. Tsuyuki and Rosenboom are very honest about using prepared piano techniques in their arrangement. They aim to imitate drums, the rattling of bones, and heavenly harps. The softest of these sounds (heavenly harps are justthe slow strumming of high strings inside the piano) are out of theordinary enough to catch your attention. The rapping on wood, scrapingthe bass strings, drumming with the palms of your hands on the bassstrings all-add to the sonic picture. Musical additions include secondarylines in many of the cadenza figurations, octave doublings, and the like. This is guaranteed to be a unique performance but might not please purists. "Here, a sound potential inherent in the piano is mobilized, which gives this paraphrase an almost literal intensity over "Dies irae" (Day of Wrath). Phenomenal!" [...]The precisely matched interaction partially conjures magical sounds from the piano. Technical difficulties are not transposed to the surface but become part of the tonal contrasts. In their version, Tsuyuki & Rosenboom go one step beyond Liszt's art of transcriptions. The grand piano is also used as a percussion instrument in order to immitate a thunderstorm, and a glissando of strings in the inside of the piano makes additional timbres. This is stunning and exciting at the same time. A strong debut CD. The Liszt-engagement of the duo Tsuyuki & Rosenboom is impressive.